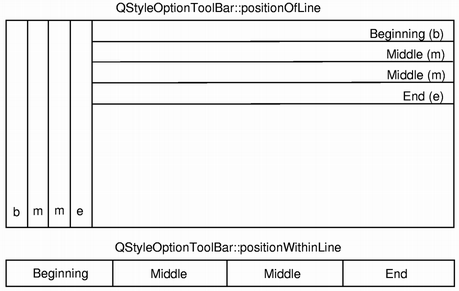 The QStyleOptionToolBar class is used to describe the parameters for drawing a toolbar. QStyleOptionToolBar contains all the information that QStyle functions need to draw QToolBar. The QStyleOptionToolBar class holds the lineWidth and the midLineWidth for drawing the widget. It also stores information about which area the toolbar should be located in, whether it is movable or not, which position the toolbar line should have (positionOfLine), and the toolbar's position within the line (positionWithinLine). In addition, the class provides a couple of enums: The ToolBarFeature enum is used to describe whether a toolbar is movable or not, and the ToolBarPosition enum is used to describe the position of a toolbar line, as well as the toolbar's position within the line. QStyleOptionToolBar::Type SO_ToolBar The type of style option provided (SO_ToolBar for this class). This enum is used to describe whether a toolbar is movable or not. QStyleOptionToolBar::None 0x0 The toolbar cannot be moved. The default value. QStyleOptionToolBar::Movable 0x1 The toolbar is movable, and a handle will appear when holding the cursor over the toolbar's boundary. The ToolBarFeatures type is a typedef for QFlags<ToolBarFeature>. It stores an OR combination of ToolBarFeature values. See also features and QToolBar::isMovable(). This enum is used to describe the position of a toolbar line, as well as the toolbar's position within the line. The order of the positions within a line starts at the top of a vertical line, and from the left within a horizontal line. The order of the positions for the lines is always from the the parent widget's boundary edges. QStyleOptionToolBar::Beginning 0 The toolbar is located at the beginning of the line, or the toolbar line is the first of several lines. There can only be one toolbar (and only one line) with this position. QStyleOptionToolBar::Middle 1 The toolbar is located in the middle of the line, or the toolbar line is in the middle of several lines. There can several toolbars (and lines) with this position. QStyleOptionToolBar::End 2 The toolbar is located at the end of the line, or the toolbar line is the last of several lines. There can only be one toolbar (and only one line) with this position. QStyleOptionToolBar::OnlyOne 3 There is only one toolbar or line. This is the default value of the positionOfLine and positionWithinLine variables. See also positionWithinLine and positionOfLine. Constructs a QStyleOptionToolBar, initializing the members variables to their default values. This variable holds whether the toolbar is movable or not. This variable holds the line width for drawing the toolbar. This variable holds the mid-line width for drawing the toolbar. This variable holds the position of the toolbar line. The default value is QStyleOptionToolBar::OnlyOne. This variable holds the position of the toolbar within a line. This variable holds the location for drawing the toolbar. The default value is Qt::TopToolBarArea.